When gardening is a big hobby of yours and nothing makes you happier than the green grass of your lawn, then you are at the right address here. Here you can find everything for maintaining a smooth, sleek and green lawn. Frank has lawn mowers of all shapes and sizes, so you can control the grass and prevent your garden from turning into a true jungle. 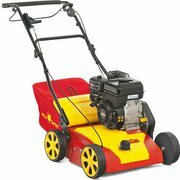 Frank also has scarifying machines that allow you to remove the moss from your lawn and keep your grass fresh and green. In addition to lawnmowers and scarifyers, you will also find grass trimmers here, to keep even the edges of your lawn taut.